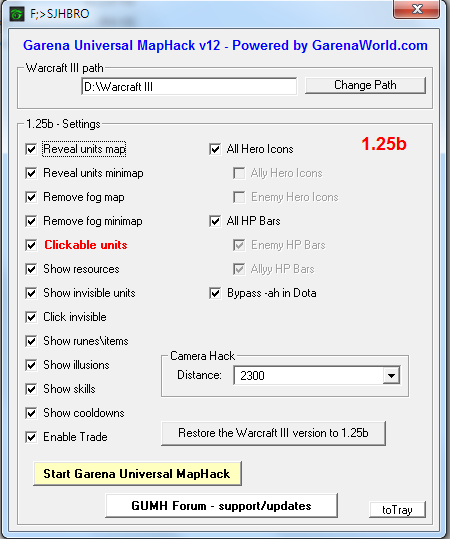 Garena Universal MapHack v12 - GUMH v12 for 1.25b - This is the updated version of GUMH that supports Warcraft III blizzard patch v1.25b (1.25.1). This works ONLY with Garena ( it does not work with battle.net ). Use original Garena and avoid using it with other Garena cracks (like protection removers, dll unloaders, cracked versions etc) or it will get detected. How to install Garena Universal Maphack 12 - GUMH 12 for Warcraft 1.26b? First you must download "Garena Universal Maphack 12 for Warcraft 1.26b". Extract content into any folder then double click "Garena Universal MH.exe"
Set Warcraft 3 Path by clicking "Change Path" button. Execute Warcraft 3 using Garena client. Note : If you got W3 loading error please UN-CHECK SOME BOXES! Where to Download Garena Universal MapHack 12 - GUMH 12? What are the other versions of Garena Universal Maphack? Visit our list of GUMH versions here : Garena Universal MapHack Download.